RETIRE IN STYLE BLOG: Will You Make the Choice or Will It be Made For You? We received a letter from our friends in Oregon with their Christmas letter attached. I always look forward to Beth's missive. Her family is very interesting and she is naturally very proud. Best of all she has a way of telling her story without appearing to brag. That my friends is a trick. But what interested me the most about her words this year was the message about the positive side of change. See, her world is not perfect. I don't suppose that anyone's is. 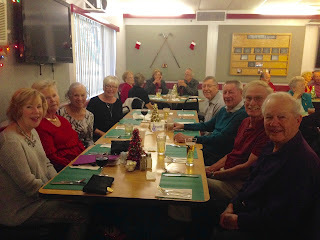 Christmas Party at local golf course. Change is the substance that keeps us alive and moving. Without it we would crumble in our chairs. Aging is not a good time to decide to live in a "forever" house or dig in and refuse to do what is necessary to grease the wheels for ourselves and our families. In the place where my husband and I live in the winter, change is expected and even inevitable. Even the structures we live in are not permanent in anyway and they symbolize what the future holds. It is the choices we make now that will ease the necessity to face change in the future. Recently one of our residents moved into an assisted living facility nearby. She is keeping her car but will have meals provided. The apartment allows pets and that is a great comfort for her. She is moving freely without a child demanding that she do it. Oh my goodness, I hope that I have the grace and courage to do what she is doing. So, to my friends Beth and her beautiful husband Lee I say thank you for sending us a letter with pictures that told about all the change in their family's lives. You are both an inspiration. Yep. We had a conversation just this week with our oldest daughter after she "assessed" that we are still fully ourselves. But we'll continue to have the conversation each year. I have always suggested that a visit to the parents is a good way to do that "assessment". We can always put on a good show for a few hours or even several days. But in the end the truth will come out. When it does, we need to be willing to hear what the children have to say. "Change is the substance that keeps us alive and moving. Without it we would crumble in our chairs." This is really the essence of what will create healthy aging. I love this quote. I think of my mother and how she is "crumbling in her chair." It is her choice, but I don't necessarily think it is a good one. I hope to spare my children making these difficult decisions by making them for myself when the time comes. You speak truth. Thank you Sally. My heart aches when I hear a child say that their parent is unwilling to take the help offered and make the change. Unfortunately that choice can ruin no only the parent's life but the child's too. I wish you much luck and happiness. My mother in law, who is 88, waited too long. We begged her to move - she had a split level house, with stairs everywhere she needed to go, and had fallen multiple times (plus had bad arthritis in her knee). Finally, her health left her no choice - on top of nearly running out of money due to bad financial decisions. I hope I learn the lessons she's taught me. You are so right. In many cases we just have to wait it out. If the parent is unwilling to make a change it is not possible in many cases to drag them kicking and screaming out of their house. RJ, You have the right mindset I think. Honestly, in spite of what I write I do not worry that much about the future. But I do try to get a feel for what my choices with be when the time comes. As we all know the future may bring what we DON'T expect. I see that truth all the time. I am assuming that your wife is ill. I send my best. God bless.